Q: What are the benefits of an outdoor lighting system? 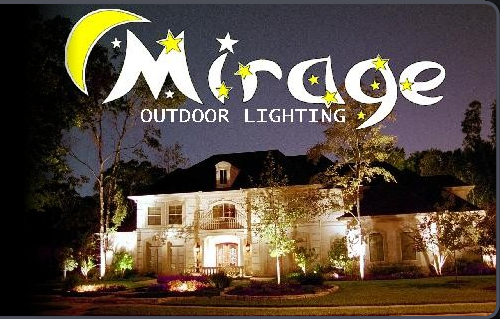 A: An outdoor lighting system installed by Mirage can provide you with the enjoyment of having your home or landscape elegantly lit, while also providing security, without your yard looking like a runway or baseball field. Q: Are the light fixtures of quality workmanship? A: Mirage uses only quality, brass, copper or powdered-coated fixtures. This ensures that the fixtures will not rust or corrode. Q: What if I have a problem with my lighting system? A: We are typically out within 3 days to resolve your lighting issue. Q: Who will service my system, change burned out bulbs, clean lenses, etc? A: Mirage has affordable maintenance programs available so you do not have the burden of trying to locate the bulbs and change them yourself. Q: Are your companies prices competitive? A: Mirage will beat any price given by a professional lighting company, which uses equal equipment, by at least 10%. *Mirage does not consider landscapers or irrigators professional lighting installers. In fact, the majority of our repair calls are to repair systems they have incorrectly installed. Q: Will there be an increase in my electrical bill from the lighting system? A: Most properties do not experience an increase in electrical consumption because previous inefficient lighting such as floodlights were in use. Q: How long will I have to wait to get an outdoor lighting system installed? A: Once an agreement is made, most systems are complete within 2 weeks.